Ukraine–with its steel mills, coal plants, bountiful agricultural resources, and massive population of 46 million people–has always, according to Russia experts, been key to Putin’s vision for the Eurasian Union. Why does Putin risk a war in Ukraine to build his Eurasian Union? 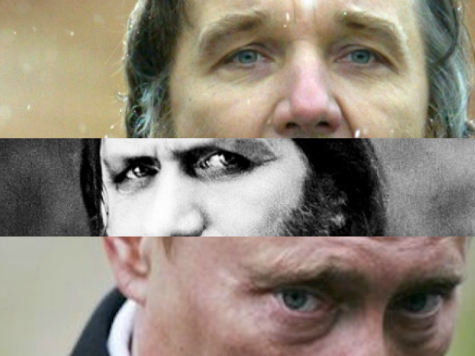 Because he is implementing–in whole or in part–the Eurasianist doctrine which was developed by the man know as “Putin’s Brain:” Aleksandr Dugin (pictured, top). Dugin’s Foundations of Geopolitics helped reshape the views of Russia’s political and military elite in the late 1990s and gave a new form to old prejudices against the Western nations by means of the Eurasianist ideology. Putin appears to have given support to Dugin’s Eurasianism from the earliest days of his presidency: the Evraziia (Eurasian Movement) was organized in April 2001 as the “brainchild” of presidential counsel Gleb Pavlovsky. Eurasianism has not only found favor with the Putin regime: Gennady Zhuganov of the Communist Party of the Russian Federation and Vladimir Zhironovsky of the Liberal Democratic Party have both proclaimed their adherence to varying forms of Eurasianism, and Dugin is credited with having influenced both men.